Nowadays most of us are familiar with the typical scenario when a jointly used home computer is becoming an object of family contention. Actually, it would be better to purchase a PC for each member of your family! Have no budget for an extra computer? No problem! IBIK company knows how to share your computer and obtain two workstations instead of just one without buying new equipment. We offer you ASTER – powerful 2 computers in 1 program designed to meet computing requirements of your family. ASTER 2 computers in 1 program is a cost-effective solution to set up two workplaces (or more) based on one machine. 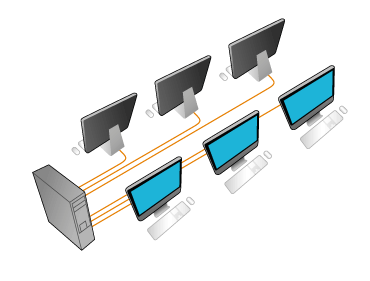 While using one computer for two monitors, several users can work with one computer independently as if each of them had their own PC. Actually, knowing how to share your computer is very beneficial allowing you to operate your PC with a full extent and increase your work efficiency. You may rest assured that setting up two monitors on 1 computer is as easy as 1-2-3. Coming with the responsive customer service and support our ASTER 2 computers in 1 program is easy to install and operate. You are able to use one computer for two monitors just by connecting keyboard and an extra mouse to the available shared computer. Moreover, our powerful software package allows running two monitors on 1 computer along with simultaneous deployment of programs, playing movies, Web surfing, etc. Besides home usage, our 2 computers in 1 system can ideally suit for equipping additional workplaces in various educational establishments and commercial companies. Our advanced software solution allows running two monitors (or even more) on 1 computer in accordance with your needs, saving you money and space.